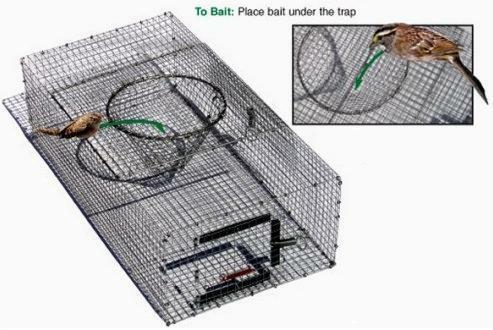 Home :: Bird Traps :: Sparrow Trap 7" x 12" x 24"
To Bait: Place bait in and under the trap. The best known way to catch pesky sparrows.There are no moving parts to break. It is constructed of 1/2" x 1/2" 19 Gauge Galvanized wire. The lid opens for easy removal of birds. Hints and Tips: Open the top lid containing the funnel. Feed the birds for a few days with the lid open to get them used to entering and leaving the trap. After the second or third day, close the lid and the sparrows should go right in having been used to eating there.Once a sparrow gets in the trap, leave it to flutter around, as it will attract others to follow. During the springtime, when they are building their nests, tear apart the nest and place the feathers and strings in the trap to help attract them as well.